Walton Hall Trout Fishery01924 257911work FishingThe lake at Walton Hall is a mature water that is over 300 years old, it surrounds Walton Hall which sits on an island. The water is not deep, the average depth is only around 5 feet, at its deepest point it is 9 feet. The water remains clear in colour all year round, unless we get some very heavy rain for a few days. The water supports an abundance of aquatic insect life and it responds well to natural patterns most of the time. Many of the fish we stock into the lake we carefully grow ourselves in our own ponds, trying to avoid any over-stocking issues and producing strong "full finned" hard fighting trout. Many of these grown-on and over-winter feeding on fry and Hoglouse through the colder months. Stocking takes place on a regular basis, sometimes weekly, but mainly monthly and we hold the stock level at around 200 fish to the acre. Fish size varies from 1.75lb through to 6lb, and we stock with rainbow, blue and brown trout, and tiger trout. 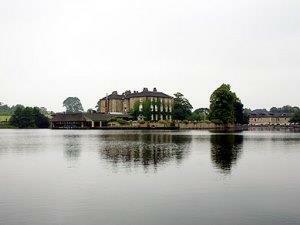 The lake at Walton Hall is a mature water that is over 300 years old, it surrounds Walton Hall which sits on an island. The fishing on the lake all takes place from boats, there is no bank fishing here due to the golf course. •Leave the M1 at junction 39. •Take the Wakefield exit off the motorway junction, Denby Dale Road - A636, towards Wakefield. •At the next roundabout go straight on (second exit), you will pass the 'Red Kite' pub on your left. •At the next roundabout take your third exit towards Crofton & Sandal onto Asdale Road - A6186. •You will pass the 'Asda Supermarket' on your left, go straight over the two mini roundabouts. •You will come to a set of traffic lights, go straight on. •At the next set of lights turn right passing the 'Three Houses' pub, onto Chevet Lane - B6132. •Turn left onto Walton Station Lane, follow the country lane to the T-Junction at the end of the road. •Take you first left onto Shay Lane. •Just before the mini roundabout turn right onto the Balk. •As the road veers to the right, drive straight onto our private drive. •Follow the private drive past the Golf Club House on the left and over the small Hump-Back Bridge. •Leave the M62 at Junction 31 and take the A655 towards Wakefield. •This will take you along the new bypass, follow the Wakefield signs for approximately 5 miles. •At the traffic lights turn left onto the A638 and then an immediate right, following the signs for Walton. •Follow the road into the village of Walton and take the third left onto Shay Lane. •Take the second right onto The Balk.